Reflecting on 2018, it’s harder to see change in our lives than it was in the past few years. Throughout our marriage, each year had been filled with big, obvious changes — moving to a new state, traveling to new places, and Curtis working or going to school somewhere new. Until this year: 2018 was the year we stayed in one place. Curtis worked the same job, we lived in the same house, we didn’t even travel outside of our home state! Things all start to blend together, just like the seasons of Hawaii, with little differences here or there that only residents of the island would notice. When you’ve grown accustomed to a life full of constant change and progression, it can be discouraging to have to settle for a season of staying in one place. This year we have to look a little deeper within ourselves to see how we’re growing, and appreciate the smaller changes happening around us. We rang in the New Year in our tiny home on Oahu, surrounded by fireworks being blown off all around us all night long — a Hawaiian tradition. We left on January 2 for our first island hop, a quick 3 day vacation to the beautiful island of Maui. We spent the first half of our time backpacking the breathtaking Haleakala Crater, then drove around the entire Eastern half of the island. Getting off of Oahu for the first time and experiencing another island gave us a taste of what ‘real Hawaii’ was like and had us excited for the next time we could escape our crowded island. A week after returning home, Curtis left for his second ride on the USS Charlotte. He was gone for 3 weeks, his longest time underway so far. Being apart is never fun, but I managed to fill my time alone with many different projects and activities, and survived. I’m not just throwing the word ‘survived’ around — the morning after Curtis left, the state of Hawaii was sent into a panic over an emergency alert that was accidentally sent out to everyone. Ok, my phone didn’t get it so I wasn’t aware until it was over, but I can still claim that I survived the ballistic missile threat on January 13, 2018. I also survived the (first) government shutdown and my dog rolling in a dead fish throughout my time alone. The law of being a Navy wife is that things can and will go terribly wrong only when your husband is deployed, and all things considered, I didn’t have it that bad. Curtis was able to experience what it’s like to be on a working submarine, which maybe helped him see things in a more positive light…but at the very least, he got to get away from his broken boat for a few weeks. Curtis returned at the beginning of February, and we enjoyed having nearly 4 weeks together before his next ride. He worked 12 hour days, but we enjoyed spending all the weekends together. Important happenings include hiking and visiting the beach every weekend, and seeing our first monk seal, albatross, and whales on various hikes. Curtis left again on the Charlotte at the end of the month. One of my highlights from this year was hosting my family for several weeks! Their timing couldn’t have been better — my mom and youngest sister arrived the day Curtis left for his third ride, and the rest joined a week later. I loved getting to show them around the island, take them on some of my favorite hikes, and make some of my favorite recipes. We all watched the USS Charlotte pull into port together as Curtis returned home after 2 weeks away — his final ride for the year. Once Curtis qualified as a watch officer on his submarine in April, a new ‘normal’ began. It started with duty days every 4 days, on top of the 12+ hour work days (duty day means he stands watch for 24 hours). By mid-May, it switched to every 3 days, and continued that way until mid-September. It’s complicated to explain, but basically he would have a total of less than 4 days off every 3 weeks. We were in this continuous cycle of constant work and nights away, trying to make the most of any evening together and the one or 2 days of ‘weekend’ that we had. It was hard, but somehow it also made time seem to go by faster. There have been so many days where we’ve struggled to find the good in this position. It’s so discouraging to have things go the way they are after Curtis had put in so many years of training to get to this point. We wonder nearly every day what would life be like if we hadn’t gotten the order modification last year. However, we are thankful for the community we have here, the families on the boat we’ve gotten to know, and for how the challenges have given us a way to grow closer to each other and to God. And while the work was discouraging, at least we were together! When I look back at the year for myself personally, I am most proud of how I was able to remain positive day after day. Nothing about the navy wife life is easy, but this year I began to see how God has been preparing me for this throughout my entire life. There’s far too much to say about that matter, so maybe I’ll write more about this in the future. For now, I am so grateful for my parents and the way I was raised, for all the long-distances friendships that I had, and for the opportunities I’ve been given and ways I’ve been allowed to always be there for Curtis and support him on the harder days. A highlight for me over the summer was being able to spend some time with my cousin, Bethany. She was working on island and we were able to spend several weekends together. Her family also came out to visit, and it was great catching up with everyone after over a year apart! I have also continued to work virtually for the pastor from our church in Arizona on his website, NeverThirsty.org. This year, we focused a lot on improving the SEO (Search Engine Optimization) and have seen great results from our work. I’m so thankful for what I’ve learned through working on the website, and that I’ve been able to keep working with him for over 4 years while living in 6 different states. 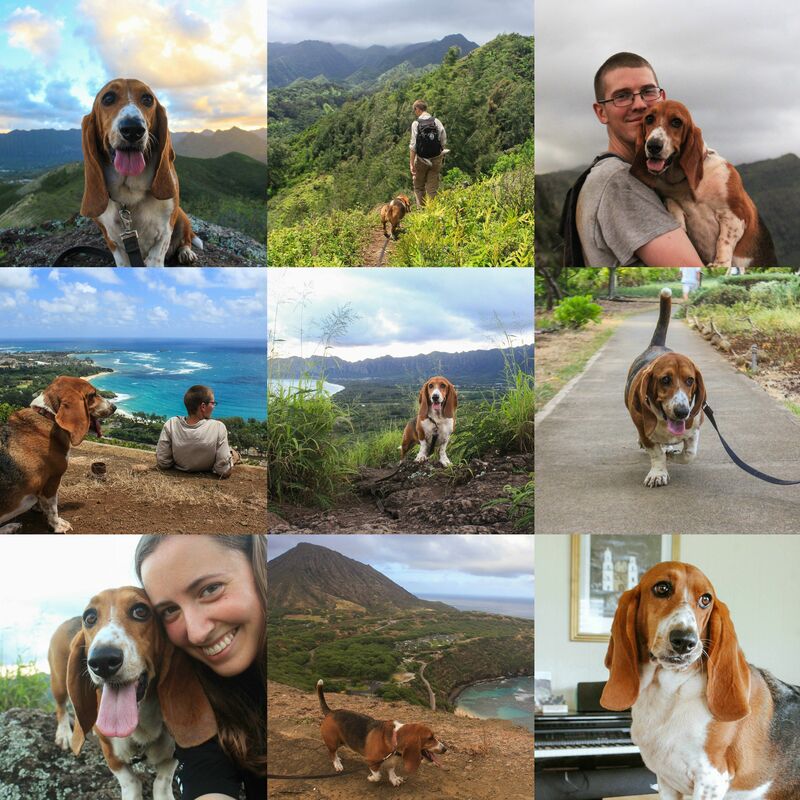 Whenever Curtis had a day off, you could always find us on a trail somewhere on Oahu. We have gotten to know this island very well and have enjoyed finding hidden gems. 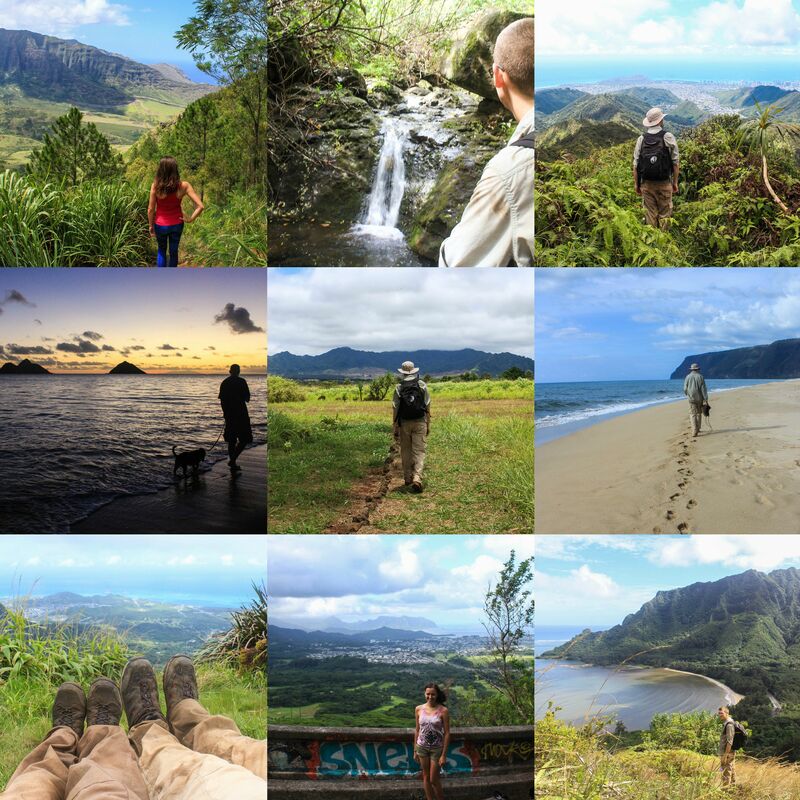 Some of our favorite hikes have been Kulepeamoa, Maka’ua Falls, Koko Crater Botanical Garden, Kealia, and Konahuanui. We also started doing more sunset hikes than we have in the past, hiking easy favorites like Makapu’u Lighthouse and Ka’iwa Ridge many times. We visited our favorite beaches many times as well, and walk to the nearby park often. When at home, we enjoy trying new recipes together, playing games or doing puzzles, or just being lazy together. We’ve continued to try to work on our gardening skills, and while we may not succeed at growing very much, we do have one thing that is continuously producing: sweet potatoes! Charlotte turned 4 on July 14. When people see her, they usually say ‘she’s still a puppy!’, and I hope they never stop saying that. She enjoys joining us on our easier hikes, and is always up for a walk to the park or on the beach. Her favorite thing to do is chase lizards around the yard. She’s made some friends at the park, and enjoys being watched by our neighbors when we travel. On July 27, we celebrated our 5th wedding anniversary. Curtis had tried to take a week off so that we could travel to the Big Island to celebrate, but all his requests were either denied, or accepted and later cancelled. It turned out for the best though — the volcanoes were erupting and causing earthquakes and poor air quality throughout the summer. 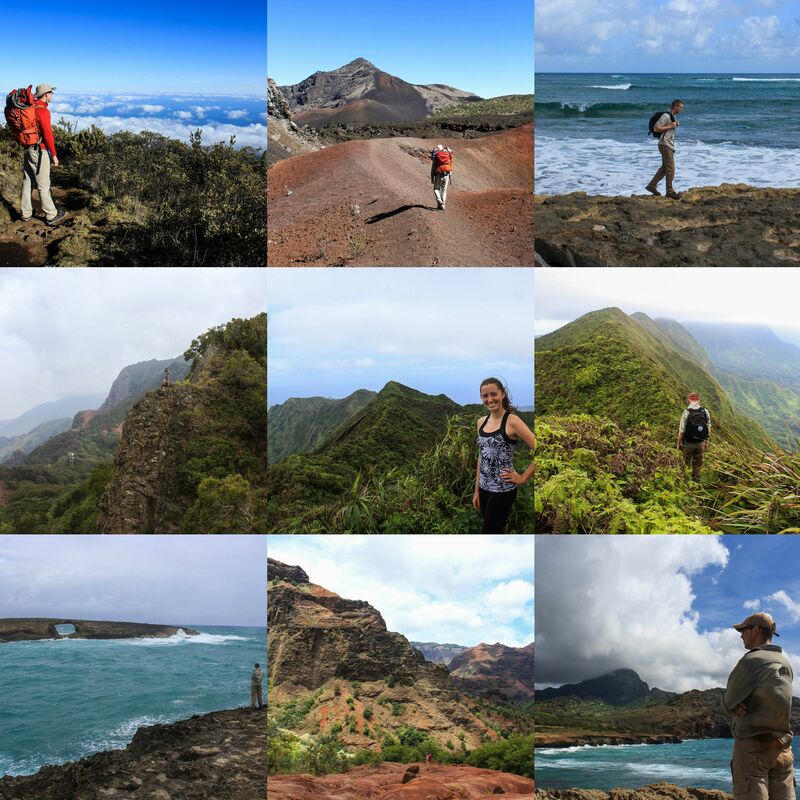 Instead, we waited until we could take just a few days off, and traveled to Kauai for 3 days full of exploring and hiking. It was hot and exhausting, but totally worth it. August and September brought about many hurricanes and tropical storms — or at least warnings of these. The most ‘eventful’ was all the hype right before Hurricane Lane, but that one didn’t even bring us any rain. Still, we were thankful for the extra days off Curtis had. We can officially say that we survived our first full hurricane season! If this year hadn’t been discouraging enough already with work, this fall it seemed as though we just couldn’t catch a break. It started with our Jeep: it developed this new quirk where it would stall and shut off when at stop signs or stoplights, or sometimes even while driving! So fun. We had a continuous cycle of Curtis diagnosing the problem, buying new parts and spending his day off replacing and fixing it, only to have it happen again a week later. Curtis also had to spend a weekend doing a little DIY repair on the house — thankfully one we were aware of from the inspection a year ago, and besides that home ownership has treated us quite well. Then Charlotte started having health issues and it broke our hearts to see her in pain. By November, we finally decided we had had enough of dealing with our broken Jeep, and we bought a used car off of Craigslist. It still doesn’t have a name because of our lingering trust issues with vehicles, but it has thankfully helped to reduce some stress in our lives. It’s a Ford Fusion Hybrid, much more high-tech than the Jeep, and we are loving how much better the gas mileage is. This brings us to December. 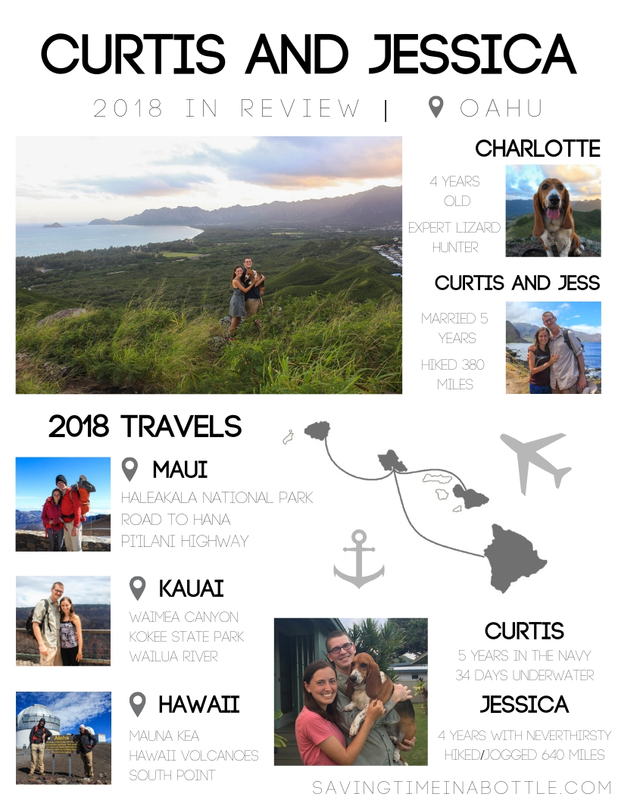 Curtis had an intense work schedule for the first half of the month, but once the work was finished we were finally able to take our dream vacation: 6 days on the Big Island of Hawaii. We had anticipated this and planned for this trip for over a year, set our goals high, and by the grace of God were able to complete all of them. 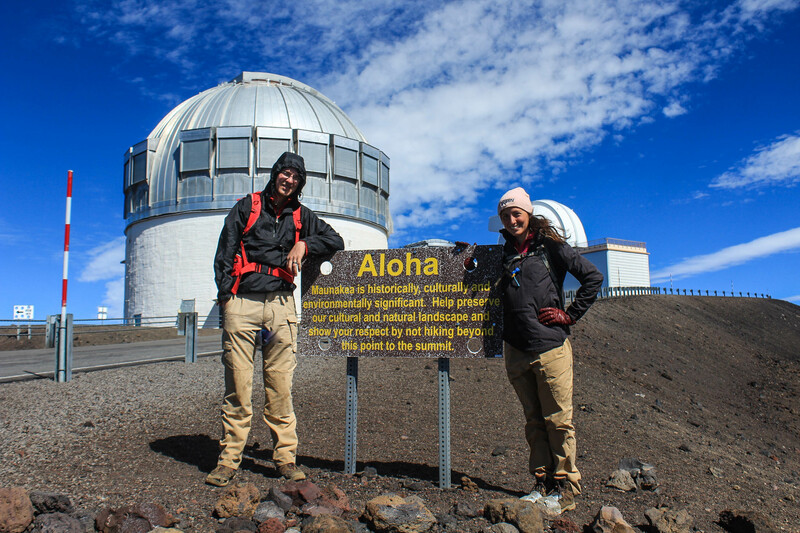 We backpacked Mauna Loa — 44 miles over 4 days — and hiked Mauna Kea, the highest peak in Hawaii. However, having spent a full year romanticizing these hikes in our minds, I have to say they didn’t go the way we thought they would. Full accounts of these hikes will be shared on this blog soon, but basically, backpacking Mauna Loa was one of the hardest hikes both mentally and physically. As we rose in elevation, we fought exhaustion and altitude sickness and questioned why we were doing this every step of the way. Mauna Loa literally means ‘long mountain,’ and the slope is such that we couldn’t see how close we were to the end, for all we knew we were just walking up an endless trail. Once we reached the crater at 13,000 feet, it didn’t feel as magical as it should have: it wasn’t a breathtaking sight and we still just felt tired and ready to be done. We questioned why we even wanted to do this hike and whether it was actually worth it. However, after finishing the mountain, we continued on with our plans to hike Mauna Kea, and things instantly turned around. While the hike was steeper and gained elevation much faster, we felt great and were able to happily stroll up to the peak hand in hand, with incredible views in all directions. At that point, we were able to fully recognize why hiking Mauna Loa had helped us: without our long and painful trek to the top acclimating to higher elevations, we wouldn’t have been so successful on Mauna Kea. It hit me as we were descending Mauna Kea that this is an analogy of what 2018 has been for us. This year, we have been slowly making our way up a Mauna Loa, so to speak. We’ve questioned over and over why we’re here and why we’re doing this. The scenery hasn’t changed, we can’t see any progression and don’t know how close we are to the end. But we can trust that while this path has tested us and challenged us in so many ways, it is preparing us for the next thing, for our Mauna Kea, whatever that may be. We still don’t understand why God sent us to Hawaii, but we can trust that everything we go through here is preparing us for something greater. And so we are coming into the new year filled with hope and trust that God knows what He’s doing. We are so thankful for the ways He protected and provided for us this year. 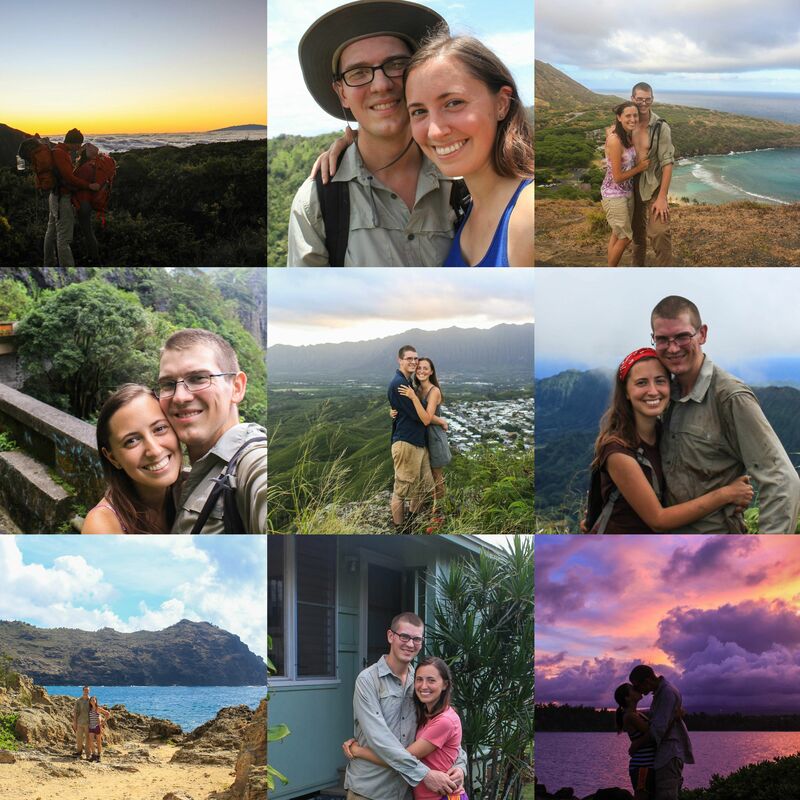 Living on a tiny island in the middle of the Pacific can feel so isolating, but He has shown Himself to me through the generosity and love of people around us, showing us that we aren’t alone. Sending all our friends and family love, we miss you all so much! We’re eagerly awaiting the day when we can return to the mainland, but until then know you’re always welcome to come see us! In 2018, we traveled to a grand total of 4 counties. It hurts just a little.